At the start of every new season I always find myself "spring cleaning" my wardrobe...even when it's not spring! It's a great time to assess what you already have, what you no longer need and what you'd like to invest in for the coming season. 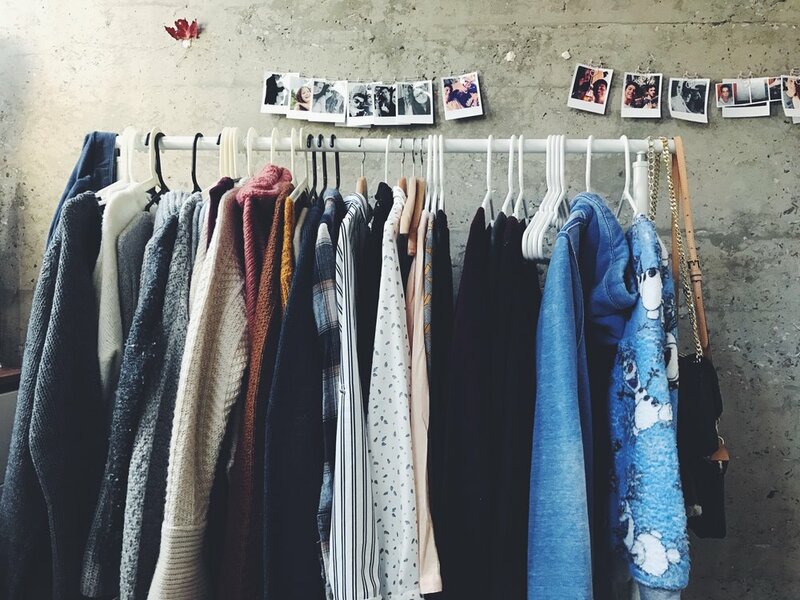 So, if your closet is overflowing and you'd like to cash in on some of that clutter, take note of these tips and tricks to sell your clothes and other items on eBay! 1. Purge and Prep - OK, so you've decided it's time to cash in on some of your closet clutter. Once you've sorted through and identified what you'd like to sell, prepare the clothes by making sure they are clean, ironed and well presented. A good rule to follow is if you wouldn't be happy receiving the item in the condition that it's in, it's probably best to look at other options than selling it. Also consider making a pile for clothes that you would like to donate to charity and another for items to be recycled. * G'Day Girl tip - Retailers such as H&M now offer the opportunity to recycle your clothes. You can drop off bags of unwanted garments - no matter what brand and what condition - in all H&M stores across the globe. In return, you'll receive a 15% discount voucher to use at H&M! 2. Research - Do your research and find out what items similar to yours are selling for. This can be done by searching current eBay listings and also through an advanced search of auctions that have previously ended. 3. Photographs - If there's one key element to selling on eBay, it's photos, photos, photos! Great photographs are key to selling online. Buyers can't see or touch the items in person, so it's essential that you provide clear and detailed photos. For clothing, I like to use a combination of photos showing me wearing the items (mirror selfie without my face showing) and items photographed flat on the floor on a white/light coloured surface or hanging against a white wall. For best results, make sure you photograph items in daylight and not at night-time or under artificial lighting. 4. Description and title - I can't stress how important an accurate description and good title is for selling on eBay. You've only got a short window of opportunity to grab your potential buyers attention. Be sure to include relevant key words in your title such as: brand name, type of item, condition and size. Make it easy for buyers to know what you're selling at a glance. When it comes to the description within your listing - be honest. Include as much information about the product as possible and accurately detail the condition and any defects. Best practice is not to try and hide any wear and tear or imperfections; if you clearly describe your item, then there's less chance a buyer is going to dispute an item they receive or leave negative feedback on the transaction. Manage your buyers expectations...isn't it better they be pleasantly surprised when they receive their item, than disappointed? 5. Timing is everything - When creating auctions on eBay, you'll need to remember that the time at which you start the auction is also the time the auction will end...however many days later. Think about when the majority of your target buyers are likely to be home and able to bid easily on your item. Whilst you may be a night owl, many people will not be keen to stay up until 3am to bid, hence you may receive a lower price for your item. 6. Sell seasonal items - Take advantage of the upcoming season by listing relevant items. Got a winter coat you'd like to off-load? Well list it for sale in the lead up to winter and you're more likely to attract buyers, rather than listing it in summer. 7. Group similar items together - It can often be difficult to sell lower cost items on their own, especially when you take into account the postage cost to buyers. What I like to do is group similar items together to create a bulk lot. This is handy for a bunch of t-shirts or work blouses in the same size or any item which hasn't got a brand name. 8. Auction software - If you plan on listing quite a few items, it can be worthwhile investing in a software program - such as GarageSale - to streamline the process. It allows you to create as many listings as you want off-line and then upload or schedule them when you're ready to start the auction. Another bonus with external software is that comes loaded with templates which can spruce up your listing and make it look more professional. You'll also be able to bypass eBay's regular photo upload service and utilise large photographs in your listing description; a nicer looking listing is more likely to attract buyers. 9. Communication is key - It pays to be a good communicator on eBay. By answering buyer questions promptly, posting sold items quickly and uploading a postal tracking number, you'll be on your way to becoming a trusted seller with a great feedback profile. I hope these tips inspire you to clear out some of that clutter and get selling on eBay. Oh, and you've been warned...it's addictive! Happy eBaying! Have you tried selling your unwanted items on eBay? Let us know some of your tips and tricks in the comments below!